The Rathskeller at Old World Village is a downstairs restaurant and pub with sausages, sandwiches, beer, mixed cocktails and a local audience of regulars who enjoy talking, socializing and relaxing. 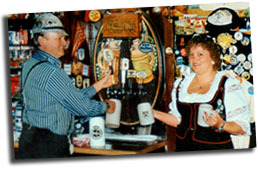 Located across the cobbled plaza from Old World German Restaurant where Oktoberfest, Mardi Gras and many festivals and buffets are held, Rathskeller is open daily and provides a tucked away, intimate setting. On Friday, Saturday and Sunday owner Lony Hauff plays a customized keyboard accordion, delighting audiences of all ages. "Although the perception that the music and environment at our local pub is for an older crowd, there's a resurgence of interest in this culture and music played by my father that attracts people in their 20's and 30's. It's actually considered cool or retro," said Monica Geub. Rathskeller overlooks the Old World Village Church. The convenience of a bar near a church is nothing new. Many of the old, established towns in the Midwest are built with churches and taverns near each other. There's a saying (song) enjoyed by some European cultures that goes like this: "In heaven there is no beer. That's why we drink it while we're here." 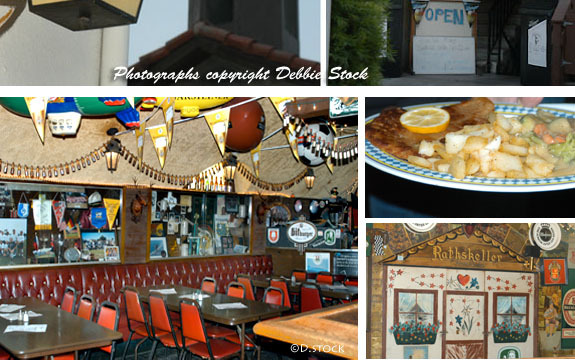 The Rathskeller, is located in Old World Village in Huntington Beach, California and is a family owned and operated pub and restaurant, serving authentic Bavarian dishes since 1978. Transport yourself back into a classic 19th century northern European pub as you are greeted by a member of the Hauff family. Rathskeller's menu includes a variety of good home-cooked German Dishes as well as some of the finest imported and domestic Beers and Wine. Be sure to check out their "specials of the week" and their regular menu of good German-American foods. Don't forget to try an Underberg, that little bottle of herbs to end your meal and give you that feeling of being bright and alert. The Rathskeller is the place to come enjoy a conversation about life, world politics, soccer, or just about any subject that comes to mind amongst good friends. The Rathskeller Pub & Restaurant is the perfect place for an intimate party (birthday, business, wedding, etc.) or get togethers of 2 - 30 people. Open 7 days a week, hours are 11 a.m. to 2 a.m.
Old World Village Rathskellar is open daily. Other restaurants in Huntington Beach offer varied prices, menus and locations in shopping centers, outdoors, at the beach, in Central Park and overlooking Main Street or the Pacific Ocean.